Slowly I started to wonder where their young 'uns were. How did they grow up? "Where are the truck babies? ", I asked myself. Why would someone like me see a truck as they would see a whale. (In fact, where would someone like me see a whale?) I am really interested in a fundamental shift of association that has occurred between beasts and machines. What parts of the Truck Babies make you think of real babies? Listen to the Big Sisters giving the Truck Babies advice. What kind of advice would you give to the Truck Babies? What advice might they give you? 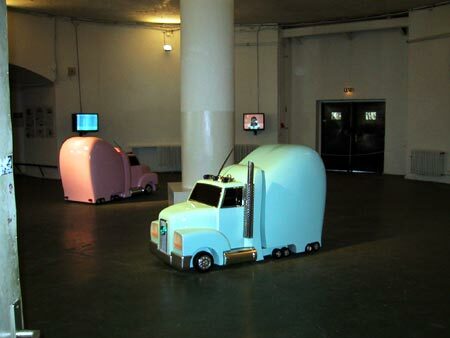 Why are the Truck Babies driving through the mountains and across the plains?